Have an idea for a feature? The feedback forums are now online so you can post your ideas today - and of course you can always tweet us directly as @twidaq on Twitter. 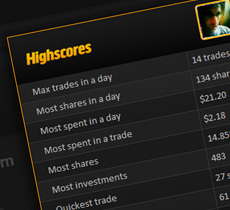 Today we're introducing a new way for you to compete against you friends, and the top traders on twiDAQ - highscores! We are recording all of your achievements, your biggest investment, most profitable trade, longest investment, the perfect bragging supply pack! The pressure is on to be the best. We've added live notifications that keep you up to date on your friends highscores. We'll let you know when someone is closing in on your highscore, and when they've beaten you! To compliment the new highscores feature, we have added a highscores button to the trader pages so that you can compare your scores against your friends, or the top traders! twiDAQ widgets are the simplest way to provide a boost to your social profile on the twiDAQ exchange. It's super easy to add widgets to your site - simply copy & paste a couple of lines of code to your website. No technical experience necessary. Done! Need to boost your social profile? Need to get your business noticed? 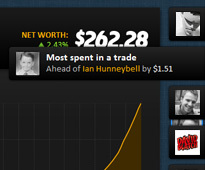 Drive up your share price with a twiDAQ widget on your website. You'll be featured on the twiDAQ exchange in front of thousands of traders; all of whom are potential customers for you & your business. Don't forget we love to have your feedback on anything twiDAQ related. Is twiDAQ the new Klout? A few exciting new indicies for twiDAQ! Unlock 24hr Trading... for FREE! Join us on Twitter to stay up to date with the latest news from twiDAQ HQ.